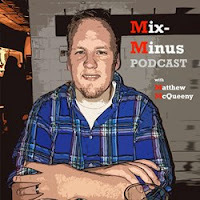 Mix-Minus Podcast | Matthew McQueeny: Verge Feature on Podcasting: "Just Press Play"
Verge Feature on Podcasting: "Just Press Play"
Podcasting is having its moment. From Alex Blumberg's "StartUp" to Sarah Koenig's "Serial", heavily-produced shows have thrust their way into the public consciousness. Podcasting is whatever its host and audiences want it to be. It can be longform interviews in a garage (like Marc Maron), marathon discussions on everything under the sun in a self-funded professional studio (like Joe Rogan), it can be live, it can be prerecorded, it can be celebrity, it can be main street. Discovering a great podcast is like when you were younger finding an indie bootleg album. Some get hundreds of downloads, some get hundreds of thousands of downloads, and some - like the aformentioned "Serial" - get 1.5 million downloads an episode. In a non-corporate broadcast environment, that is huge! Check out this video that the Verge did all about podcasting. Great work!